We have been holding specialist auctions of Historic Aviation, Transport, Arms, Medals and Militaria for over 20 years. Our biannual spring and autumn sales always include a wonderful array of historical items including decorations, orders and medals, antique swords, daggers and edged weapons, Indo-Persian weaponry, helmet plates, cap badges, uniforms, and aviation collectables, as well as books, photographs, diaries and archives, logbooks and other related paper ephemera. Group Captain Sir Douglas Bader (1910-1982). Pilot's Flying Logbook, 13 September 1928 to 27 October 1932, in which Bader recorded the aerobatic accident in Reading on 14 December 1931, which resulted in the loss of his legs, with the comment “Crashed slow-rolling near ground. Bad show”. The logbook created a lot of media interest and sold for £21,000. A South Africa “Zulu” Medal awarded to Private Richard John Morse who served with 24th Foot at the Battle of Isandlwana on 22 January 1879. Morse like most of his regiment was massacred and the medal would have been claimed by his family. 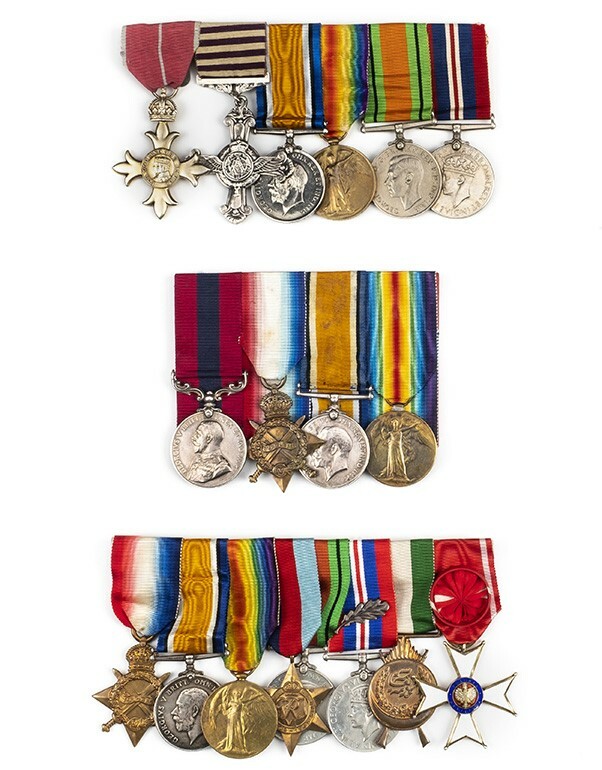 Imbued with this tragic story the medal sold for £6,600. An outstanding Second World War 1942 Immediate 'Malta' Distinguished Flying Cross to Spitfire Ace Flight Lieutenant Norman Macqueen, Royal Air Force. In his short career Macqueen was credited with 7 confirmed victories and scores of probable downed enemy aircraft. He was tragically killed in action only a few days after winning his award. This was consigned by the family along with his logbook which recorded the day to day horrors he endured. The lot sold for £5,000. The port tail fin from Messerschmitt Bf110G-4, flown by Heinz Wolfgang Schnaufer (1922-1950), who was the Luftwaffe’s top night fighter ace and accredited with 121 British and Commonwealth aerial victories. These victories were recorded on the section of the bullet-ridden tail fin with the relevant date. Consigned by a collector in Germany this emotive and powerful historical piece created tremendous international interest and sold for £90,000. An extraordinary collection of approximately 350 finely detailed scratch-built 1/72 scale models of pioneer aircraft (pre-1914). The jaw-dropping models were all the remarkable and painstaking work of one man and believed to have been constructed over a period of more than 50 years. Following a massive amount of international and media interest the collection was bought by a museum in China for £110,000. And,finally, we must be the only auctioneers to have sold an original WWI aircraft hangar; the old AVRO hangar was included in our spring sale in 2018 and sold for £100,000 hammer. It came in 'Meccano' kit form and this heritage piece has since been reassembled in the UK to the specification of the new owner with the help of the vendor. The auctions are held twice a year in May and November, for more information please contact Henry Meadows.